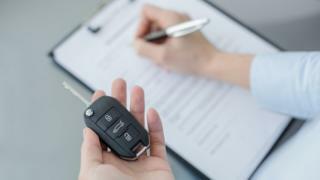 Cars were used to carry documents nearly 110 times over three years, the Welsh Government has revealed. There were 53 journeys - without ministers or officials in the cars - in 2015, 29 in 2016 and 27 in 2017. The figures were released after a Freedom of Information request by the Welsh Conservatives. The party's AM Janet-Finch Saunders called it the "height of wastefulness" but ministers said the use of cars in this way "continues to fall each year". The Welsh Government said ministerial car journeys to carry documents were "minimal as the majority of ministerial work is handled electronically". But it said that in exceptional circumstances, they were used for "business critical papers" that need to get to ministers "urgently". The move has been criticised by Ms Saunders, who said using "high-powered limousines to transport paper documents is the height of wastefulness and an affront to the taxpayer". "So far as I'm aware, all of the Welsh Government's cabinet members are capable of using emails and are perfectly able to drive, ride a bike or use public transport," she said. "There are really no excuses for this kind of slovenly behaviour." A Welsh Government spokesman said cars were used to deliver "sensitive and confidential" papers to ministers "when urgent action is required". Separate responses from First Minister Carwyn Jones to written questions from Ms Finch-Saunders revealed the cost of employing 12 drivers for 12 ministerial cars, all Volvos, had been about £282,000 so far in the current financial year. It was just under £316,500 in 2016-17.